He blasted critics of Nixon's presidency and the Vietnam War with fierce alliteration  "supercilious sophisticates," "vicars or vacillation," "pusillanimous pussyfooters" and was known to peg spectators with ill-directed golf shots, but it was Agnew's behavior before he took national office that ultimately led to his downfall. As Watergate unfolded, Nixon  wanting to deflect negative attention away from himself  forced Agnew to publicly announce in 1973 that the Justice Department was investigating bribery accusations dating from Agnew's tenure as governor of Maryland. Agnew declared that had "nothing to hide," but weeks later he was indicted and pleaded no contest to the felony charge. He was fined $10,000 and sentenced to probation. Agnew's fall did little to help his former boss, who resigned a year later. 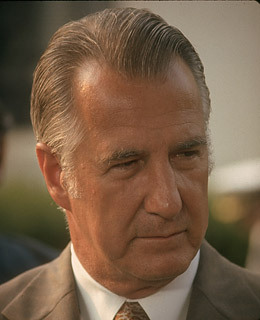 In a 1980 book, Agnew claimed he had been innocent but resigned under pressure from Nixon.